On the New Messages panel, there are several functions available: Play Message, Call to Play, Forward, Download, Save, and Delete. You can hover over each button to see the function. The Messages tab allows you to see all of your messages, including the New, Saved, and Trash folders. On the Messages tab, there are several functions available: Play Message, Call to Play, Forward, Download, Save, and Delete. You can hover over each button to see the function. 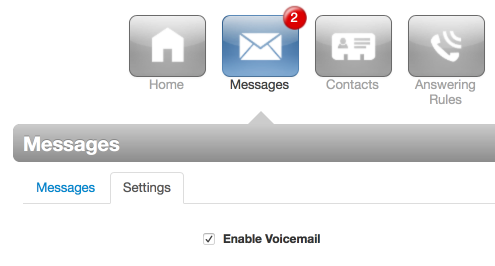 You can access your voicemail settings by clicking on the Settings tab in the Messages section. 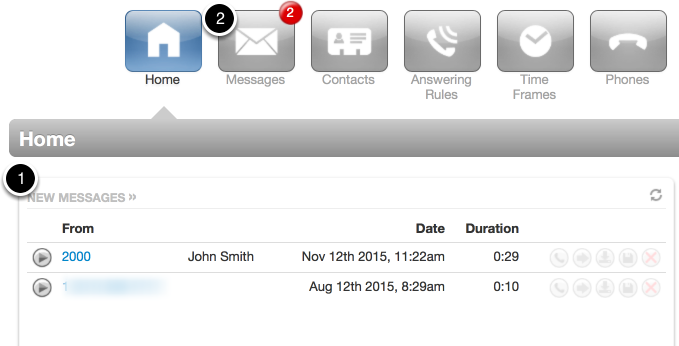 The Greetings section allows you to manage your voicemail greetings and recorded name. The recorded name is used in the Company Directory and is required to be listed. Details on managing your greetings can be found here. Unified Messaging allows you to set your email notification options. You can choose to have the voicemail sent as an attachment or include a link you can click on. We recommend including as an attachment when possible. You can also define Voicemail Transcription options if you have this feature enabled on your account. You can also enable email notifications for full mailbox and missed calls.